The Florida Jazz and Blues Jam is scheduled for January 27th, 2018 in Boca Raton, Florida. With six headlining acts, it promises to pack a big punch. 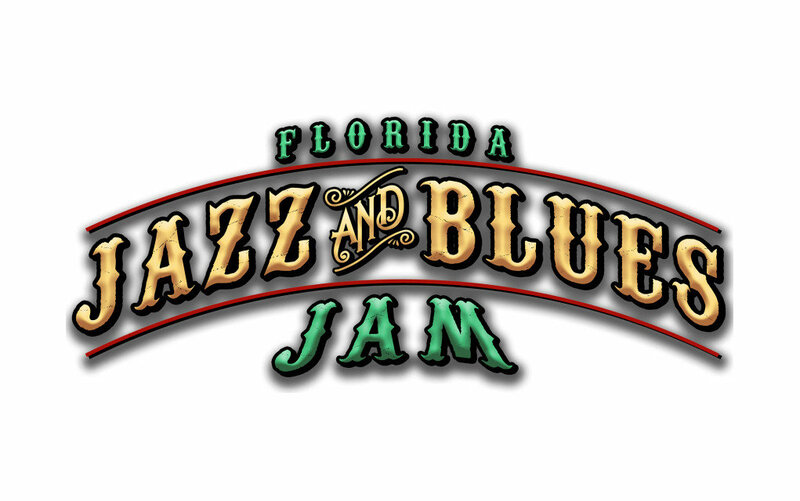 January 27th is the date of the Florida Jazz and Blues Jam 2018. One of the first events of the “festival season,” it’s a smaller, more intimate, one-day affair. However, with SIX headlining acts, it packs a big punch. Gov’t Mule is the headliner (Dr. John had to cancel this show and his New Orleans shows due to health). 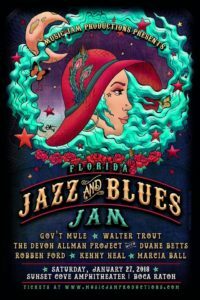 Here is the incredible lineup: Gov’t Mule, The Devon Allman Project with Special Guests including Duane Betts and Peter Levin, Walter Trout, Robben Ford, Kenny Neal, and Marcia Ball. Patrick Maraist is the sole managing member of Music Jam Productions, LLC. The organization that sponsors the Florida Jazz and Blues Jam, also puts on several others in South Florida. We caught up with this very busy man, and got the low-down on his upcoming jam. I found this very interesting, so let’s start with it. Your title is sole managing member of Music Jam Productions. Does that mean it’s a one-man operation? In other words, are you Music Jam Productions? I am. It’s privately owned. I’m not like the big conglomerates like Live Nation or AEG. I’ve got a background in music. I’ve been playing music all my life. I was in a working band in the 80s and was involved in various other businesses after that. Music has always been my passion. In 2011 I formed Music Jam Productions, LLC. It’s solely owned and managed by me. That has its benefits. The buck stops with me, as I make all the decisions. But it also means that I have a great staff, production crew, stage crew, and volunteers that help run the shows. You’re a man of many hats. The Florida Jazz and Blues Jam is not the only event you put on every year right? No it’s not. But they’re not your generic festivals per se. I don’t have the entertainers balanced out with just as many vendors and arts and crafts booths. My music jams, including the Southern Jam and the Summer Jam Seaside Concert Series are geared primarily to the music. For example, I want the attendees to have an enjoyable evening of music. So I book four to five bands and start the music around 3 PM. Although Florida Jazz and Blues Jam will start at 2 PM with 6 National Acts, we need that extra hour for the music. I put a lot of time into choosing the bands. I start with a wide open list of bands that fit the genre of each event. For example Southern Jam is Americana and more traditional country. The first year I did the Jazz and Blues Jam I had it more balanced out with jazz artists. Lee Ritenour, Victor Wooten, and Dennis Chambers shared the stage with Buddy Guy, and John Mayall. Since jazz is such a wide open genre, I’m very happy with this year’s line-up. I think I have a good representation of some great blues and jazz/blues artists. Next year there will be a few more artists closer to the Jazz genres. One thing you won’t see at my Jazz and Blues Jam is a big rock band like Pearl Jam, as much as I like them. I know some of the other jazz festivals around the country have grown so big that they’re no longer specific to the genre. I will keep my genres in check with the brand of the Music Jam. I noticed that two of your acts this year, Kenny Neal, and Marcia Ball have that New Orleans and Texas boogie-woogie sound covered. Yeah, exactly. There may be some purists that would say, ‘Where’s all the jazz?’ I understand their concern, but jazz is in the eye of the beholder really. I’m really happy and think that the artists fit the bill. The Devon Allman Project with Duane Betts and Peter Levin. They had a big introductory show at the Fillmore West in San Francisco. This is their first show after that. It’s pretty cool to me that our show is next in line after the legendary Fillmore West. How cool is it that the Devon Allman Project will be playing not only Devon’s songs, but also celebrating his father Gregg’s legacy? At our event they have a full 90-minute set. I wanted to make sure they had time to perform their original music as well as the tributes to Gregg Allman and the Allman Brothers. Then there’s Walter Trout – the comeback kid. Oh yeah, he’s on the heels of his latest album which has done incredibly well on a global scale. It remains at the top of the Billboard charts since its release in August. Walter Trout was also just nominated for two Blues Music Awards for 2018. Rock blues album of the year, and Rock Blues artist of the year. One thing about Walter, he’ll rock out a small venue with all the energy that he puts into a stadium performance. Speaking of which, your venue for this event is more intimate that some other festivals right? It’s really the perfect size. I think Sunset Cove Amphitheater is the best of both worlds. It’s not so large that the sound is going to get lost. It’s a beautiful amphitheater, surrounded by water on three sides. It’s out in nature. I chose this venue not only for its size, but for its accessibility. It’s close to Miami and Dade but also easily accessible to the West Coast of Florida for those coming in on the turnpike. With the schedules these artists have, how far in advance do you have to book them to get who you want? I actually started booking this event six month ago. I chose this time of year because January is one of the best months of the year in Florida. It’s usually sunny with temperatures in the low 70s. People who are visiting here want to attend, and people from the North or Midwest are wanting to get out of the cold. I’ve sold as many tickets to people out of state as I have to local people. We have a wide variety of acts. A couple of examples, I’ve been talking to Devon Allman for several years about getting him on one of my shows. It just so happens this is the year I was able to work out scheduling with him. I’m also very excited about having Gov’t Mule as the headliner. That band, wow, each member in their own are amazing and award-winning. But together as The Mule, this is a true legendary powerhouse. Warren Haynes and Matt Abts have deep roots with The Allman Brothers and Dickey Betts. You basically have six headliners all performing in one day. Totally. Each artist is worthy of headlining a show on their own. There is no filler in my Music Jams. Excellent performers/artists from beginning to end. I also wanted to mention, A lot of people ask if there’s a VIP section. The way I look at it, for my shows, everyone is a VIP. Not to sound cliche’ but ticket prices are very reasonable. You could pay the admission price to see any one of these bands, even in a large bar. I’m not doing this to get rich. I’m trying to make memories more than money.